How to Boost Productivity in 2016 - Toronto, Markham, Richmond Hill | SunTel Technologies inc.
We all experience those days where we feel like we’ve been super productive and have managed to check off a bunch of tasks from our to-do list. But if you feel like these days are few and far between and you’d like to up the ante on a more consistent basis, it’s time to adopt a new approach to productivity. Whether you need to get organized in your personal or working life, laying down ground rules for yourself and considering the following tips could work wonders. When it comes to business, competition is fiercer than ever: you might have rivals undercutting your prices, you could be a bricks and mortar store pressurized by internet-based sellers, or perhaps you’re struggling to get a grip on your processes, marketing plans or even employees. By upping your efficiency stakes, working in a more agile fashion, and simply getting more work done more quickly, you could find that you’re holding the key to solving your problems. Your issues with productivity might be personal, or they may well stem from your staff. As a small or medium-sized business owner or manager, you can’t afford to sit back and let your own inertia or disorganization, or your employees’ lack of dynamism, drag your company down. Take action and start getting to grips with your workload and help your business get 2016 off to a far more efficient start. Okay, admittedly taking ‘time out’ sounds counterintuitive for increasing productivity, but hear us out. By taking a few minutes at the start of every morning, you’ll be getting the day off to a calm and orderly start, thereby increasing the chances of you being more productive, as opposed to running around like the proverbial headless chicken for the rest of the day. Part mindfulness and part preparation, begin by emptying your head of any thoughts. Be in the moment and spend a minute or two breathing deeply. Next, consider the things most playing on your mind in relation to what needs to be done either today or in the near future. Jot them down on a piece of paper, followed with a short outline on how you are going to tackle them. Then set your mind to going forth and making those resolutions happen, one by one. 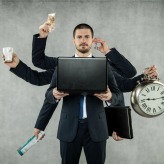 Some reports say that multitasking can negatively impact on your productivity by as much as 40 percent. When we’re taking on more than one task at a time, the perception is that we’re killing it productivity wise and getting loads done. The reality is that we’re spending the majority of the time jumping from one thing to the next and not fully focusing on any of them. You need to exercise willpower to commit to ‘singletasking’ but before long it should come as second nature. Pick one thing that you are going to work on and stick to it until you have finished, or at least done everything you can for the time being. This includes not checking your email during that time – surely one of the biggest productivity sappers of all time. If the temptation is too strong, log out of your inbox on your computer, and set your phone to silent if you have audible alerts configured. If you’re worried you’re going to overlook something during this time period, use an online or physical notepad to note down spur of the moment thoughts or ideas. It’s no secret that the traditional 9 to 5 is on the way out. Being connected and contactable around the clock is putting paid to that, but is being constantly online actually counterproductive? How effective are you really at 11pm at night when you’re slumped in front of The Walking Dead with a beer and a spreadsheet full of data? Take a tip from the latest round of startups that are taking a sledgehammer to the idea that we need to work around the clock, and are instead turning the working week on its head. The CEO of one rising startup has gone as far to institute a five-hour workday that runs from just 8am to 1pm, taking into account that studies show people are more productive earlier in the day. The theory goes that making people sit in an office for 8 hours a day, whilst giving them ample time to be productive, equally gives them just as many hours to waste time. A shorter working day could instill a greater sense of urgency in employees, who in turn respect the company’s consideration of their personal lives and work harder. Depending on your business, changing your working hours may not be practical, but it could still be food for thought - and adopting a singletasking approach and planning your day ahead calmly and clearly is achievable and will never hurt. If you’d like to find out how implementing better IT and more efficient procedures can help you beat the productivity blues, get in touch with us today.